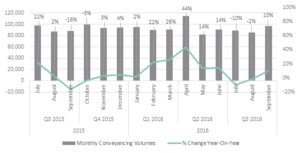 Comparison of year-on-year conveyancing volumes reveals drops during July and August during aftermath of the EU referendum, followed by a 10% upturn in September. Overall, completed conveyancing activity dropped by 5% in Q3 2016 over the previous quarter but remained stable year-on-year. Despite this, firms outside of the top 1,000 conveyancing firms were alone in seeing an annual fall in transactions, while business grew for the rest of the market. Following the initial shock felt in July and August as transaction volumes saw year-on-year drops of 10% and 2% respectively, September witnessed an upturn of 10% as a degree of confidence and momentum returned to the market. The number of completed transactions in September, the last month of the quarter, sat at 97,623 – a 10% increase on September 2015. This made it the highest monthly figure seen since October 2015 (99,868), with the exception of April of this year when registered transactions reached 114,425 as a result of the rush to beat stamp duty charges for buy-to-let properties and second homes. The Conveyancing Market Tracker – which uses Land Registry data to examine competitive pressures in the conveyancing market – shows that following the Brexit vote, firms ranking in the top 1,000 saw their market share relatively unchanged in Q3, rising quarter-on-quarter from 72% to 73%. However despite the overall stability in the market, the top five firms took the biggest hit in total transaction volumes with a 9% fall between Q2 and Q3. Those at the bottom of the market – firms ranked outside the top 1,000 – saw the second greatest quarterly fall as their total conveyancing volumes dropped by 8% from 79,467 in Q2 to 73,323 in Q3, as the market slowed over the summer months. Firms ranked between 6 and 20 were the only grouping to witness an increase in transaction volumes, which rose by 5% across the quarter. Year-on-year comparisons however paint a more positive picture. The Tracker reveals that conveyancing volumes for Q3 2016 were higher for most firms in the market compared with Q3 2015. Despite short-term quarterly drops, the top five firms saw a collective 2% rise in activity compared with the same period in 2015, while the only industry players experiencing falls were those outside the top 1,000. Despite the testing economic environment, the total number of firms active in the conveyancing market remained stable in Q3 2016 – falling slightly from 4,281 in Q2 to 4,260. “As British businesses come to terms with the political and economic turbulence of the past quarter, conveyancers are demonstrating a reassuring robustness in testing times. Our tracker for Q3 reveals that the industry has been broadly resilient, despite an initial dampening in activity following the Brexit vote. Buyers and sellers hesitated to make their move back in July, but the transaction volumes we are now seeing show a clear bounce back in activity, and suggest a more positive path towards the end of the year. “With the exception of April’s ‘stamp duty surge’, September witnessed the most monthly completed transactions since October 2015. In fact, the lull that many expected following the decision to leave the EU has resulted in just a 1% drop in activity year-on-year, while the top 1,000 firms in the market continue to attract more business than a year earlier.